An early start at 7am in order to ride the short 10 miles along the coast from Brighton to Newhaven to catch the 10am sailing. It felt really cool riding onto the cross channel ferry with the prospect of France in front of us. After completing 300 miles in 3 days, 3 back to back tons as someone remarked,everyone was feeling a bit worn out but there was still plenty of banter amongst the group. Our expectation levels were high for the feeling of the achievement of having finally reached France by pedal power. I was still pinching myself that I had ridden all the sodding way from Yorkshire taking in that horrendous 120 miler on the 1st day and the massive accumulation of ascents. Now we were about to hit the Normandy shores of France. Flatter terrain perhaps? Immediately on de-embarkation Smudge, our brilliant mechanic and medic had to re-adjust my seat as I had ridden it to Newhaven at a peculiar ski jump angle as it had been shaken loose by the massive vibrations of the past few days. Everyone had pushed on immediately so I set the Garmin on pursuit and off I teared. This as time trial stuff and I was loving it. 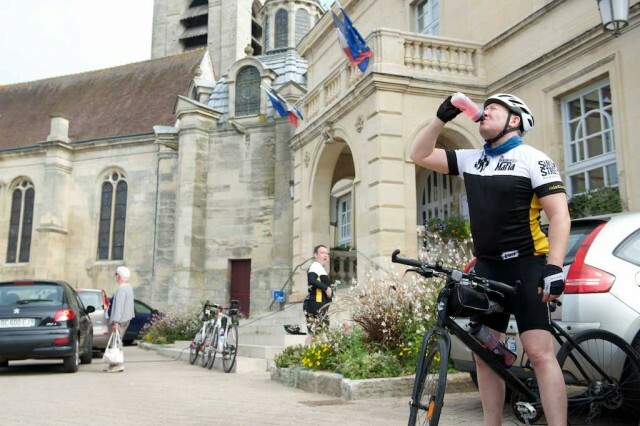 I was really pumped up and ecstatic to be powering along through the French countryside. I really pressed the pedals hard averaging 35 km/hr. After 30 mins and 17 km gone I finally caught the rest of the team. I decided to fasten on to the class A riders who set a barnstorming pace along the converted former train track of Avenue Verts (the green line). However, after half and hour the pace was too much so I eased off setting my own more modest pace. But, 10 km before the scheduled refreshment stop I passed the group as they had punctured. That was it I seized the moment accelerating past them. As I hurtled along my aim was simply to get to the refreshment stop before they did however, the Garmin took me around the middle of the town where it was located so I found myself back on the open road. Balls to it, I went for broke Gourney on Brey was only 20 km away so why not go for a solo break away to the finish? The Yellow Joursey would be mine today. So funny, as this was not really a race at all. I clicked through the gears clocking 40 km/hr for long periods rolling up and down the beautiful countryside on a brilliantly sunny afternoon. 10 km from the finish Helen and Jaime tried to flag me down, no chance I was a man possessed and I was not stopping for no one. I gave them the thumbs up as I sped by. They honked their horn in appreciation. Later, Helen said that she could not believe the speed that I was doing. They passed me immediately but to my surprise when I entered the small town centre of Gournay En Bray they were nowhere to be seen. in fact, I had beaten the support van to the finish line. Wow, brilliant. Man, I was pumped.